The fuel system is designed to provide an uninterrupted flow of clean fuel from the fuel tanks to the engine. The fuel must be available to the engine under all conditions of engine power, altitude, attitude, and during all approved flight maneuvers. Two common classifications apply to fuel systems in small aircraft: gravity-feed and fuel-pump systems. Figure 7-30. 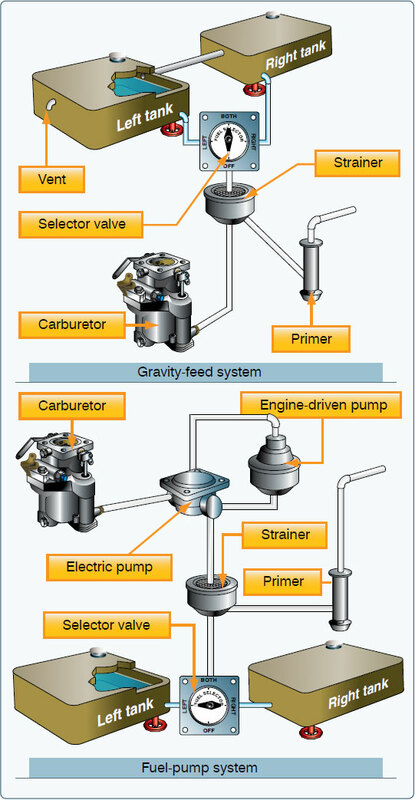 Gravity-feed and fuel-pump systems. Aircraft with fuel-pump systems have two fuel pumps. The main pump system is engine driven with an electricallydriven auxiliary pump provided for use in engine starting and in the event the engine pump fails. The auxiliary pump, also known as a boost pump, provides added reliability to the fuel system. The electrically-driven auxiliary pump is controlled by a switch in the flight deck. Both gravity-feed and fuel-pump systems may incorporate a fuel primer into the system. The fuel primer is used to draw fuel from the tanks to vaporize fuel directly into the cylinders prior to starting the engine. During cold weather, when engines are difficult to start, the fuel primer helps because there is not enough heat available to vaporize the fuel in the carburetor. It is important to lock the primer in place when it is not in use. If the knob is free to move, it may vibrate out of position during flight which may cause an excessively rich fuel-air mixture. To avoid overpriming, read the priming instructions for the aircraft. The fuel tanks, normally located inside the wings of an airplane, have a filler opening on top of the wing through which they can be filled. A filler cap covers this opening. The tanks are vented to the outside to maintain atmospheric pressure inside the tank. They may be vented through the filler cap or through a tube extending through the surface of the wing. Fuel tanks also include an overflow drain that may stand alone or be collocated with the fuel tank vent. This allows fuel to expand with increases in temperature without damage to the tank itself. If the tanks have been filled on a hot day, it is not unusual to see fuel coming from the overflow drain. Figure 7-31. Fuel selector valve. 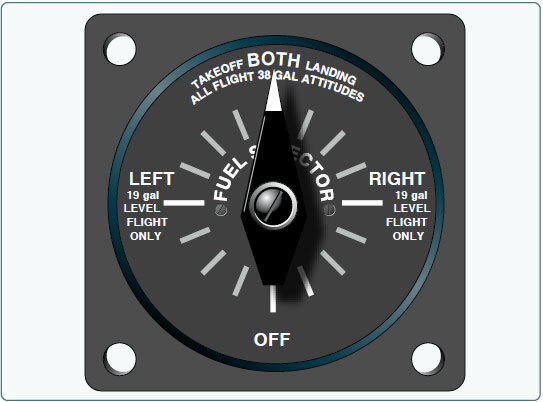 Fuel placards show any limitations on fuel tank usage, such as “level flight only” and/or “both” for landings and takeoffs. Regardless of the type of fuel selector in use, fuel consumption should be monitored closely to ensure that a tank does not run completely out of fuel. Running a fuel tank dry does not only cause the engine to stop, but running for prolonged periods on one tank causes an unbalanced fuel load between tanks. Running a tank completely dry may allow air to enter the fuel system and cause vapor lock, which makes it difficult to restart the engine. On fuel-injected engines, the fuel becomes so hot it vaporizes in the fuel line, not allowing fuel to reach the cylinders. After leaving the fuel tank and before it enters the carburetor, the fuel passes through a strainer that removes any moisture and other sediments in the system. Since these contaminants are heavier than aviation fuel, they settle in a sump at the bottom of the strainer assembly. A sump is a low point in a fuel system and/or fuel tank. The fuel system may contain a sump, a fuel strainer, and fuel tank drains, which may be collocated. Water in the sump is hazardous because in cold weather the water can freeze and block fuel lines. In warm weather, it can flow into the carburetor and stop the engine. If water is present in the sump, more water in the fuel tanks is probable, and they should be drained until there is no evidence of water. Never take off until all water and contaminants have been removed from the engine fuel system. Aviation gasoline (AVGAS) is identified by an octane or performance number (grade), which designates the antiknock value or knock resistance of the fuel mixture in the engine cylinder. The higher the grade of gasoline, the more pressure the fuel can withstand without detonating. Lower grades of fuel are used in lower-compression engines because these fuels ignite at a lower temperature. Higher grades are used in higher-compression engines because they ignite at higher temperatures, but not prematurely. If the proper grade of fuel is not available, use the next higher grade as a substitute. Never use a grade lower than recommended. This can cause the cylinder head temperature and engine oil temperature to exceed their normal operating ranges, which may result in detonation. Several grades of AVGAS are available. Care must be exercised to ensure that the correct aviation grade is being used for the specific type of engine. The proper fuel grade is stated in the AFM/POH, on placards in the flight deck, and next to the filler caps. Automobile gas should NEVER be used in aircraft engines unless the aircraft has been modified with a Supplemental Type Certificate (STC) issued by the Federal Aviation Administration (FAA). Figure 7-32. Aviation fuel color-coding system. Special Airworthiness Information Bulleting (SAIB) NE‑11‑15 advises that grade 100VLL AVGAS is acceptable for use on aircraft and engines. 100VLL meets all performance requirements of grades 80, 91, 100, and 100LL; meets the approved operating limitations for aircraft and engines certificated to operate with these other grades of AVGAS; and is basically identical to 100LL AVGAS. The lead content of 100VLL is reduced by about 19 percent. 100VLL is blue like 100LL and virtually indistinguishable.